9/16" O.D. x 1/8" I.D. Orders with long lengths may come in multiple sections. In these cases, the smallest section will be 4ft. Example: If you order 8 feet of rubber, you will receive 2 sections of 4 foot long segments. 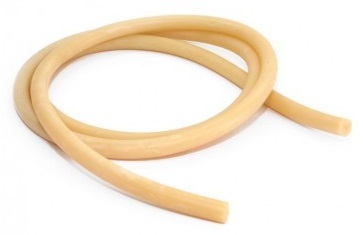 RIFFE’s Power Bands are made of “Gorilla Rubber”, the highest modulus power band material available as tested. Contains antioxidants for longest life. Keep stored in an air tight, dark, cool environment. Click the button below to add the Riffe 9/16" Amber Gorilla Speargun Band-Bulk Rubber to your wish list.